Observed at Kitale, Kenya, Africa. October 2016. The ovapositor can be seen at the posterior emerging from under the wings. 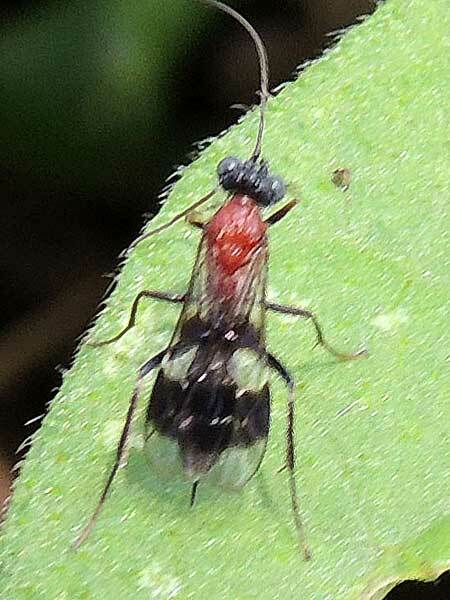 Ichneumon and other parasitic wasps are severely under appreciated by the general public. Firstly they often go unnoticed because they are often quite small - the one shown here is larger than many kinds at almost 7 mm. Also, because they do not sting they are not felt. However, these insects are vital to a farmer's success because they serve to keep many crop-feeding insects in check. Female ichneumons are able to insert minute eggs into a host insect that eventually kills the insect as it matures into a new wasp. In natural environments they are key components of what is commonly called the "balance of nature". Copyright Michael J. Plagens, page created 19 June 2017.